As of March 1, Rick Gorne has once again teamed up with Adrian Reynard and will join the Auto Research Center as its Business Development Director. This dynamic combination grew Reynard Racing Cars into the world’s largest race car constructor in the early 2000’s. Since then, Rick has spent the last 15 years as a race car driver manager to some of the world’s best drivers in the top echelons of racing. Rick will concentrate on bringing ARC’s talents to future racing programs across the globe. Concentrating additional efforts into the international racing arena will bring ARC back to its roots, IndyCar and F1 racing. “Rick and I enjoyed a unique partnership which was critical to the growth of Reynard Racing Cars over a period of 20 years. I am thrilled that we are able to work together again at ARC where his personality, influence and devotion to customer care will enable ARC to expand across new frontiers of automotive development” states Adrian Reynard, Chairman and majority shareholder of ARC. Rick will remain based in Europe with several visits throughout the year to the US. Following up on past ARC newsletters where we compared Long Nose Tractors to what we refer to as Cab over Tractors. I am sure everyone was really thinking of this as a comparison of current US Tractors vs. the European style tractor which is still the classic Cab over Tractor which the United States has been completely phased out. However, that is not the direction this article is going, we are going to China where change is certainly happening. We have previously discussed the potential for up to 8% fuel savings with a Long Nose Tractor compared to a Cab over Tractor. This form of savings and safety issues associated with the Long Nose Tractor has made China, ready for change. China is also the world’s largest heavy commercial transportation country on the planet. This change is going to be a very large one and determines how it will affect commercial transportation in the United States or elsewhere in the world. Let’s first look at how this all started. Last year China changed its rules on the country’s dimension and weight regulations #GB1589-2012; this allows an additional 1 meter to the overall tractor length. This then gave the engineers the ability to move away from the long appointed Cab over Tractor. The dramatic change is not going to happen overnight; we already have one group producing such a vehicle. 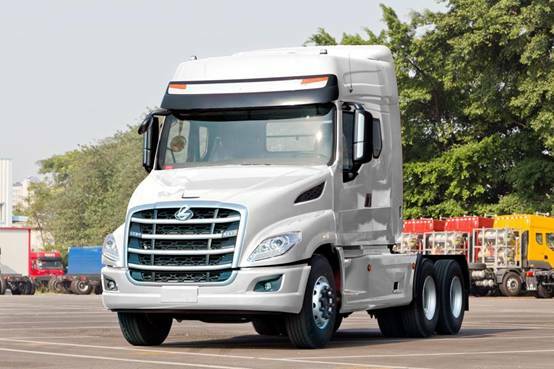 Here is a photo of the “T7” produced out of Dongfeng Group’s Liuzhou truck division. This current tractor is the first produced under the new rules package. Two other Chinese engine manufacturers, Weichai and Yuchai, are also available in this tractor package. Our current tractor manufacturers here in the US already have two new tractor companies, Nikola and Tesla, working to bring new products to the market in the near future. Both of these companies will be bringing new technologies to the Class 8 tractor sector where many tractor manufacturers have seen sluggish sales in 2016. The real question will be, how long is it before we see a Chinese manufactured “T7” running down one of our US interstates and at what price point do they enter the US market? In the world of fuel prices, only one thing is certain: uncertainty. California has just approved a 125% increase to its per-gallon diesel excise tax, with an additional 4 point sales tax increase on top of that. Gasoline is not immune either, as California joins 7 other states which have raised gas taxes in 2017 alone and other states are probably not far behind since one fifth of states haven’t raised gas taxes in over two decades. These new taxes and predictions of a five year high in gasoline market prices this summer give operators everywhere a strong incentive to use less fuel. It’s true that significant deregulation is likely in the oil and gas industry, but industry leaders say existing regulations have had little impact on their operations, so consumers shouldn’t expect much relief there. Aerodynamic development is the most cost-effective, least complicated method of effecting meaningful fuel savings across a large number of vehicles, whether a commercial fleet or a production sedan. Drag losses can account for as much as half of the energy consumed by a highway vehicle, so gains here can pay much better dividends than, for example, costly powertrain development or ineffective ‘quick fixes’ like fuel additives. As the federal government relaxes requirements on fuel economy, states may even begin to raise fuel prices as a way of managing emissions while manufacturers will no longer have incentives to develop more efficient powertrains. If this scenario plays out, production level and aftermarket aerodynamic packages may become the only viable option for cutting fuel costs on a large scale. How does following another car affect aerodynamic forces? When examining the aerodynamic performance of a vehicle we typically develop a car in ideal conditions, i.e. clean air. However, the real world dictates that cars are constantly in the vicinity of other vehicles - both on the road and in a racing environment. It is well known that any type of vehicle trailing another will be affected by the followed vehicle’s wake, but this interaction is highly dependent on the type of vehicle and the following distance! So what’s going on? How does following a vehicle affect aerodynamic performance? In racing, “slipstreaming” or “drafting” is a technique used to catch up to the vehicle in front for an overtaking maneuver – usually carried out when the chasing vehicle is within two or three car lengths. Most racing cars have high downforce devices which typically produce a strong up wash and wake behind the car. This wake has a lower total pressure than clean, still air, and the following car will experience less drag when driving through it. It’s not a perfect analogy, but the lead car does create a kind of ‘hole’ in the air, and the following car slips through with less resistance. So what’s the catch? As always with aerodynamics there is flipside. Slipstreaming works in a straight line where aerodynamic grip isn’t a priority. However, when cornering it is vital that high downforce vehicles are provided with as much air as possible for the wings and other aero devices to work with maximum efficiency. To continue the analogy, if there’s a hole in the air, the car cannot create as much downforce. Both drag and downforce are proportional to the dynamic pressure of the incoming flow, and so both forces are lower when close behind another car. Less downforce means a car will carry less speed through a corner, so what helped on the straight will hurt while turning. Turbulence plays a secondary but not insignificant role here as well. The air behind a race car can have a turbulence intensity of 40%, compared to a typical road condition of 2-10% or a wind tunnel test facility which can be as low as 0.1%! With these factors in mind, racing series the world over have attempted to design cars so that wake is not a large factor in limiting passing while maintaining levels of downforce suitable for the desired speeds. Generally speaking, more downforce equals larger wake, so this tradeoff between exciting, high speed racing and equally exciting wheel-to-wheel battles is a source of constant frustration in the world of motorsports. The solution may be to try and direct the wake away from, or up and over, the cars behind. In the case of road vehicles, wake still affects a trailing car; drag reduction via tailgating can be achieved. Although this is not legal (or safe) with most passenger cars, semi-trucks do often make use of this effect and carry out what’s known as “platooning”. Doing so not only reduces overall drag, but more importantly fuel consumption and can even assist in improving overall traffic flow.